"A coat of paint." Yes, that's all that's needed - "a coat of paint." Imagine for a moment if this were true for other facets of life. Tired of your complexion? OK , we'll just apply a coat of paint and you'll look as good as new. Never mind, that the underlying skin is spotted and wrinkled. The problem with this panacea is that too many property managers and owners actually believe that a coat of paint will suffice. The reality is that while in the very short-run, a coat of paint will mask imperfections and provide an aesthetic appeal, in the long-run, a simple coat of paint can be detrimental to the structural integrity of the building. How could this be? There are many types of paints and coatings available on the market today. The application will determine the material needed. You wouldn't paint a house with watercolors. Similarly, you wouldn't coat exterior masonry with a paint designed for wood. It's not recommended to paint a brick surface for several reasons, not the least being that brick has a natural beauty and integrity. If painted with a material that doesn't "breathe," then eventually, the face of the brick will spall, resulting in costly brick replacement. If desired, masonry that is exposed to the elements may be coated with an elastomeric, acrylic coating. Such a coating allows for expansion and contraction of the masonry surface. This is critical in climates such as ours, where the air temperature range is 100 degrees from winter to summer. It will also span over thin pre-existing cracks in the masonry and mortar joints, further protecting the interior from wind-driven rain. Lastly, an elastomeric coating will allow the wall to "breathe." Water will inevitably find its way into the faÃ§ade, traveling to the interior surface. An elastomeric coating allows this trapped water to escape without damaging the exterior surface. These coatings come in a palette of colors that are resistant to UV rays. Thus, color is retained. Equally important to selecting the right material to coat the building surface, is the mixing and application processes. Proper preparation of the surface is essential for the longevity of the coating. Consistency in coating thickness and direction will ensure a uniform texture. Typically, a two-coat process is required. Drying time between applications is dependent upon the humidity. Selecting the right paint is important for interior applications. Again, proper preparation of the surface is the most critical part of the painting process. Applying a finish coat before the prior coats have dried will result in alligatoring. If the surface isn't cleaned properly, then the paint will not adhere, and will chip off. If there is moisture, then blistering will occur. Typically, walls are painted with an eggshell finish. Eggshell provides for a more uniform look, hiding small imperfections in the wall. Semi-gloss is used on doors, frames, and chair rails. These surfaces come into contact with oily fingers, causing them to get dirtied more quickly. Semi-gloss paint is more easily cleanable than eggshell. While flat paint is the most difficult to maintain and clean, it is used on ceilings, away from dirty hands. It also minimizes glare and hides imperfections. A simple coat of paint isn't what it's cracked up to be. Actually, it can cause further cracking if you're not careful to select the right application and material. 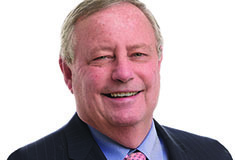 Richard Yaffe, R.A., is vice president - asset management, for Triangle Properties, Jericho, N.Y.